We did some research and chose Paraiso Vineyards as our first stop (http://www.paraisovineyards.com/). We were not disappointed. The tasting room attendant Jeff was helpful and knowledgeable of wines of this region. We told him we were on a Pinot Noir quest. See the picture of the wine list. And some of the pictures of the winery. The winery tasting room in Soledad was in a vineyard setting and very beautiful. All of these were delicious along with the Pinots on the list. 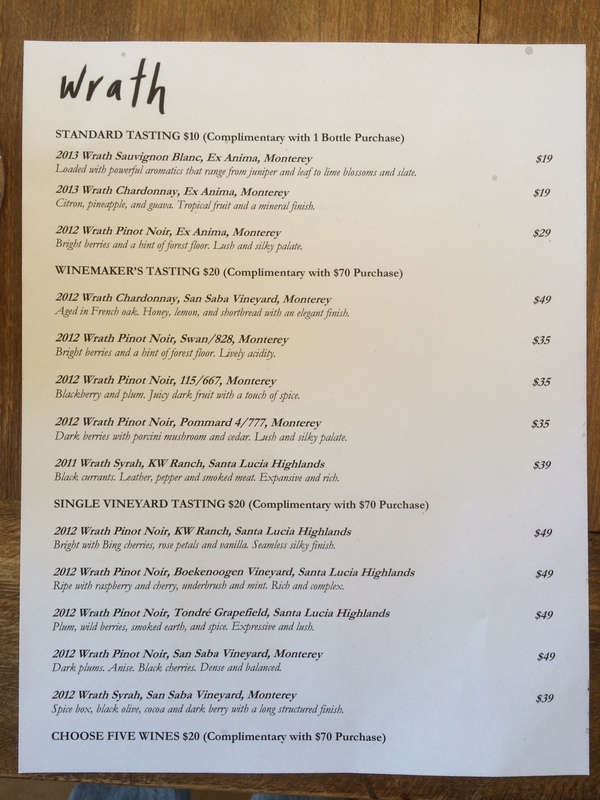 As we were at Paraiso, Jeff recommended we visit Wrath Wines since we were interested in visiting boutique wineries. As the picture shows, the winery has a nice pond and provides a scenic view. The wine list consisted of several Pinots and all were memorable. Our tasting room attendant Michelle was both helpful and knowledgeable and made us feel at home. After visiting these two wineries, we called it a day. In our experience, since we don’t spit out the wine, two wineries in an afternoon are good (and enjoyable). We headed off to Monterey where we spent the night in a hotel. And took some time enjoying Monterey (you can ask us about our Monterey experience but for the purposes of this post, I’m keeping it to our wine trip). On our way home, drove down Carmel Valley road and made our first stop at Talbott Vineyards. This was a busy tasting room that was decorated with a vintage motorcycles. The Pinots were good. But what got our attention was the 2012 Audrey Chardonnay that smelled like burnt popcorn but was creamy delicious to the taste. Our next stop was Boekenoogen Winery which was down the road from Talbott. Boekenoogen was recommended at every winery we visited, so we were compelled to stop here. This place did not disappoint. We tasted the reds only – the Pinots were delicious and the Zin, Syrah, and Petite were memorable. Overall our wine tasting trip through the Santa Lucia Highlands was fun and memorable and a place we would visit again. We obviously only scratched the surface. All the SLH Pinots were fruit forward, and balanced (right amount of acidity, tannin, alcohol) and more complex than what we normally taste in our area. The prices (on the high side like around $50) clearly reflected the craftsmanship involved in making these wines. The wines we bought are something we would definitely save for special occasions.